The Project Manager dialog displays information about the current project which is returned by current-project. Most information about projects is displayed and much can be changed by changing fields in the dialog. 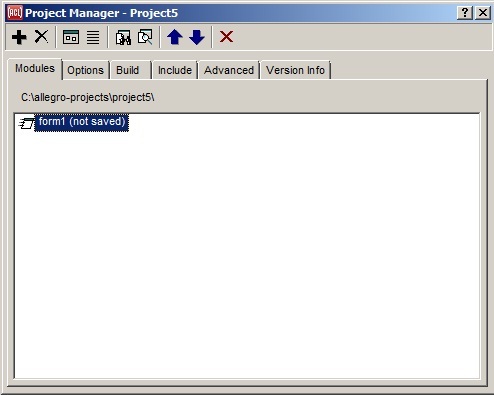 The Project Manager dialog is displayed by the View | Project Manager menu command. As shown in the illustration, the Project Manager has six tabs, Modules, Options, Build, Include, Advanced, and Version Info. Add file (a plus): add a module (source, form, subproject, library, distributed file, distributed directory, or editable file) to the project. When using the Project Manager dialog's Add button to add files to a project, you can specify multiple files in the file selection dialog, as long as they are in the same directory, and for the same type of module. Use the Move Up (up arrow) and Move Down (down arrow) buttons to place the new module in the desired location with respect to other modules. Remove File(s) (an x): delete the selected object, usually a file, removing it from the project. Edit Dialog Form: display the selected form. Edit Source Code: open the form .cl file or the selected .cl file in an editor buffer. View Project Source: open the project .lpr file in an editor buffer. Inspect Project: Inspect the project in the Inspector Window (opening or exposing the Inspector as necessary). Move Up (an up arrow): works when Modules Tab is exposed. Move the selected file up in the list of files. Move Down (a down arrow): works when Modules Tab is exposed. Move the selected file down in the list of files. Close the Current Project (a red X): Leaves the IDE running with no current project. When not actively working on a project, a few IDE commands may default more conveniently when there is no leftover current project. See close-current-project.